The handbag. It is a staple in the closet of many women, who often rotate through bags depending on their needs, destination or mood. It is those three elements—need, destination and mood—that all came together for Kim Archambeau, owner and founder of La Bella Couture, on a flight to Atlanta with her 3-year-old and 2-year-old in tow. On that flight Archambeau found herself having to tote some items for her kids in a plastic grocery bag. It was then she realized that many diaper bags lacked functionality as well as personal style. The liner could not be easily cleaned after a bottle spill, and that inspired Archambeau to design a diaper bag that gave her the best of both worlds: fashion and function. What began as a desire to make mommy duties a little bit easier has now grown into a successful custom bag line. 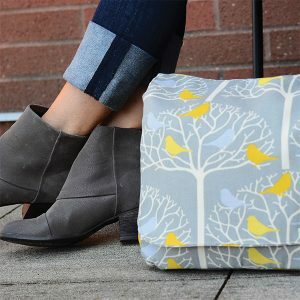 Based in Puyallup, Archambeau has expanded her line to include messenger bags, camera bags, clutches and cross-body bags, wristlets, and yoga bags. What makes her products unique is the level of customization, so each bag is personal to the woman carrying it. Customers can select from fabrics offered through the website or even choose their own. La Bella Couture has partnered with New Beginnings Homes in Pierce County, where portions of bags are sewn by a seamstress in training. Each bag contains at least one waterproof compartment for things like water bottles or umbrellas. And all the bags are machine washable. Designed for fashion and function, these bags are worthy of a spot in every woman’s handbag rotation.